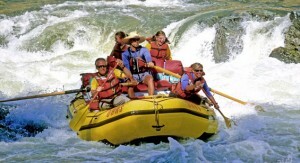 Rafting is one of the many great activities opportunities you'll find in Canmore. When you’re a wedding guest, as opposed to the bride and groom or immediate family, weddings sometimes aren’t that much fun – especially when you have to travel somewhere to attend. That’s another great thing about a wedding in Banff National Park and the Canadian Rockies: there is no end of things to do for your guests. In fact, by planning ahead, you can make sure your guests get the most out of their Canadian Rockies trip, and make your wedding more fun at the same time. Ciara Daykin, wedding planner and owner of Firefly Occasions, suggests the bride and groom plan group activities for guests. “Your guests will all feel like they are friends by the time the wedding actually happens.” She notes that guests will want to get out and experience the Canadian Rockies anyway, and by planning group activities, the bride and groom can create a bonding experience for their guests without incurring extra cost. “You don’t have to pay for everything, you just have to have it organized,” she says. Below, you’ll find a list of information to help you and your guests plan their stay in the Canadian Rockies. Everyone in your wedding party should be able to find the right accommodations in and around Canmore or Banff. Whether they need a castle, a cabin, a boutique hotel, or are just happy to have a hotel room, you’ll find it all listed in our accommodations section. Need to impress your spouse’s parents? Put ‘em up in a five-star resort hotel and spa! If you’re already to book rooms or you just want to check out availability, you can check on hotels and reservations throughout Banff, Canmore, Lake Louise and Banff National Park from our reservations page. If your guests complain that they’re bored on their trip here, you’d better check their pulse; there are plenty of things to do. There is no shortage of hikes, scenic drives, tours, historical sites and other activities in and around Canmore, Banff, and Banff National Park to keep them busy, entertained, and out of your hair during their stay in the Canadian Rockies. At some point your guests are going to get hungry during their stay here, but there are restaurants in Banff that fit just about everyone’s tastes here. Our restaurants in the Canadian Rockies are as varied and awesome as the peaks that grace the Western Canada skyline.